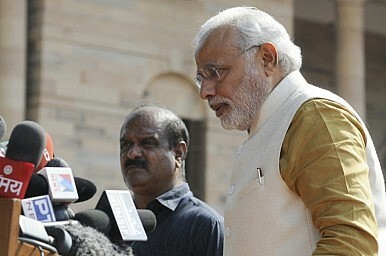 Modi needs to move India beyond platitudes in its engagement with Southeast Asia. As expected, the South China Sea issue once again grabbed the headlines in the latest round of Asian regional summitry held in Myanmar earlier this month. Less in the limelight, but no less consequential, was India’s first engagement of the Association of Southeast Asian Nations (ASEAN) since its new Prime Minister Narendra Modi was elected last month. Despite India’s oft-cited cultural and civilizational links with Southeast Asia and some notable advances in its much-touted Look East Policy since 1991, both sides agree that ASEAN-India ties are far from reaching their full potential. Southeast Asia – with the exception of Myanmar – had also been conspicuously absent in Modi’s foreign policy statements, which have largely focused on neighboring South Asian states and major powers like China and the United States. The new Indian government’s first foray into a formal ASEAN gathering produced some encouraging signs. At the India-ASEAN meeting, External Affairs Minister Sushma Swaraj focused her remarks on “connectivity,” the reigning mantra in Modi’s regional policies which refers to a host of infrastructure projects to speed up Asian integration. That suggests a strong economic bent in the relationship that would both help New Delhi to develop its Northeastern states and Southeast Asia to form a more united ASEAN Economic Community over the next few years. ASEAN, for its part, said both sides will likely sign a long-delayed free trade agreement in services and investments later this month and proposed strengthening cooperation in several areas, including agriculture, energy, and science and technology. India’s relationships with pivotal Southeast Asian countries are also gaining steam. New Delhi’s ties with Singapore, its strongest in the region, are expected to grow even tighter as both sides agreed to step up their defense partnership on August 19. Relations with Vietnam are also on the uptick, with Hanoi renewing India’s lease of two oil blocks in the South China Sea for another year before Swaraj’s first visit there next week. And Myanmar, the only ASEAN country that shares a physical land border with India, is in a league of its own in Modi’s eyes since it is New Delhi’s gateway to Southeast Asia. Modi himself is expected to visit both Vietnam and Myanmar by the end of 2014. But as is often the case with ASEAN-India relations, the problem is not the lack of ideas but the inability to follow through on them. Take India’s relations with Myanmar. Earlier this month, India’s former ambassador to Myanmar VS Seshadri warned in a report that two key infrastructure projects – the Trilateral Highway and the Kaladan Multi-modal Transit – need to be completed on time by 2016 in order to realize the full promise of bilateral ties. Judging from past experience, this is far from assured. For all the talk of India’s Look East Policy, formal India-Myanmar land border trade is still a measly $35 million. At the sub-regional level, countless reports – including one I authored back in 2010 – have encouraged India to revitalize groupings like the Bay of Bengal Initiative for Multi-Sectoral Technical and Economic Cooperation (BIMSTEC) and the Mekong-Ganga Cooperation (MGC), but to no avail. Perhaps a Modi government, with its “neighborhood” focus, will finally take steps in this direction. “Look East” has been the paradigm used to frame India’s approach to ASEAN since the days of Narasimha Rao in the 1990s. But given the gap between rhetoric and reality in ASEAN-India relations in the past, I have preferred to say that New Delhi’s strategy in the coming years should be to “Act East” more concertedly, following the remarks former U.S. Secretary of State Hillary Clinton delivered on a visit there back in 2011. As India prepares to draft the next five-year plan of action for ASEAN-India relations beginning in 2016, it should keep in mind that it will be judged less on the platitudes in that document than on its ability to deliver on specific initiatives on the ground in Southeast Asia. A new report highlights the growing economic ties ASEAN is enjoying with India. Singapore's China-India Balancing ActHow India's State Governments Boost Outreach to Southeast AsiaIndia to Hold Military Drills With Singapore Amid Navy AnniversarySihanoukville: A Cambodian City Losing Its ‘Cambodian-ness’Is Vietnam Creeping Into a Succession Crisis?